A behind the scenes look into the repurposing of Charleston's Mendel Rivers Federal Building into a luxury boutique hotel called The Dewberry Charleston. Here in Charleston, we’re surrounded by a rich and distinguished history. (That’s to be expected of one of the oldest cities in America.) You can read about it in books, you can see it on the streets, and you can feel it at The Dewberry. 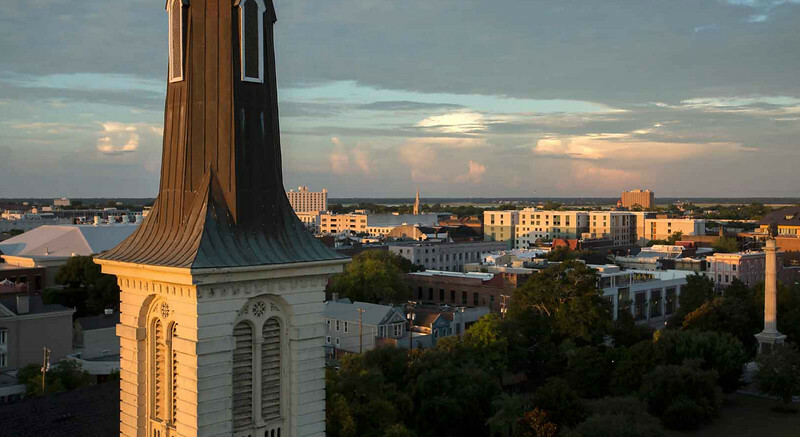 Charleston’s rich history lives in the very bones of our hotel, which was built from the renovation of the former Mendel Rivers Federal Building. Google Streetview image of Mendel Rivers Federal Building in 2012. 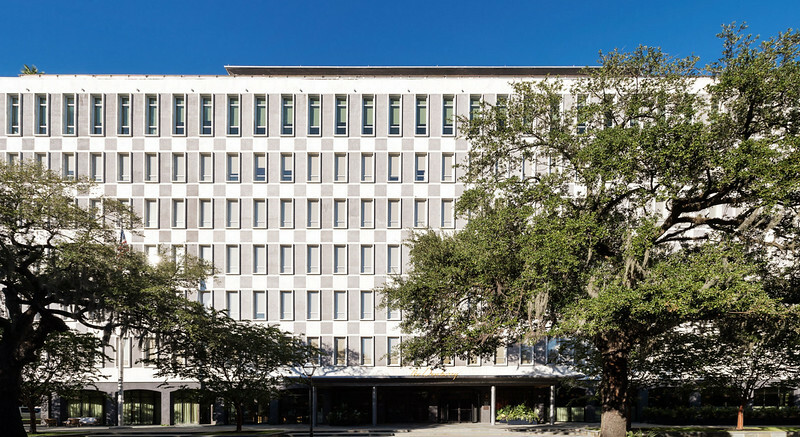 John F. Kennedy commissioned this mid-century modern structure, and in 1964 it was named for Charlestonian L. Mendel Rivers, to commemorate his 30 years of service in Congress. The building stood as a shining product of “The Great Society,” a set of domestic programs launched by President Lyndon B. Johnson that sought to eliminate poverty and racial injustice. The Mendel Rivers Federal Building was proudly occupied for 35 years. In 1999 Hurricane Floyd severely damaged the building and the government decided to close the facility. However, the history and memories still lived within the walls. Walls that some wished to demolish so the property could be developed from the ground up. But in 2008, visionary developer John Dewberry saw its potential. In his mind’s eye, John saw a place where people gathered, lived, loved, did business and created memories. The history and memories forged within the walls of the Mendel Rivers Building were too cherished to tear down. 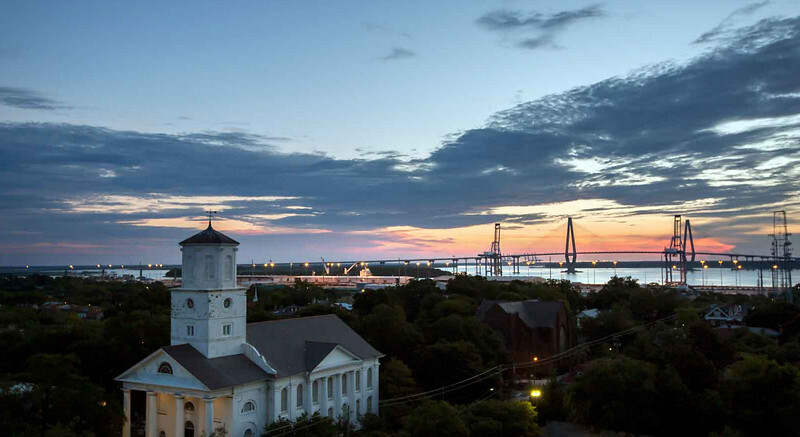 Today, The Dewberry stands as an intersection of Charleston’s past and present. It is an enduring asset for which all can be proud. While the building’s interior has been recreated, the marble-and-brick facade has remained largely as is, thereby preserving the architectural integrity of one of Charleston’s few examples of mid-century modern. Indeed, the original lobby marble was preserved , re-cut, and today lives as the table tops on Henrietta’s outdoor dining terrace. As we open our doors, we invite you to add to the cherished history of our building. Our staff is here to help guide your stay – in fact, some come to The Dewberry as former federal employees who worked in the very building in which our hotel operates today, proof that history is ever-present in our Charleston home. We welcome you to come and create your own memories – memories that will in turn become part of The Dewberry’s story.